← 7 Days of Learning Mandarin (Chinese) – Through Music! You may not recognize the word “bullroarer”, but you probably recognize the sound it makes. 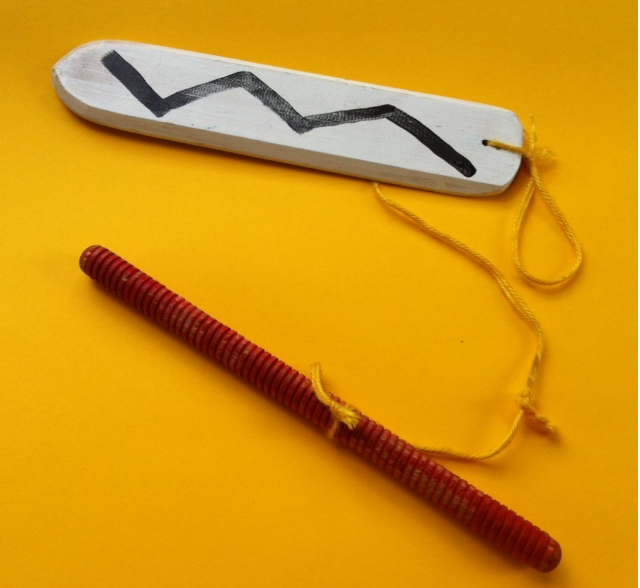 Used by both Native Americans and Aboriginal Australians, this simple instrument spins around and produces a whirring sound that is truly unique. Made from a simple piece of wood attached to a string, the bullroarer is spun with one hand then swung around in a circle with the other. As it spins, a remarkable whirring, buzzing noise is produced that can be heard quite a distance away. It’s easy to see how this was used originally to signal other people or to communicate in times before telephones or modern devices. This activity could not be easier. All you need are recycled water bottles of various sizes and sturdy string or twine. Start by tying the string around the neck of the plastic water bottle, securing it tightly with several sturdy knots. If you like, add a stick to the other end of the twine or tie the string into a loop to make it easier to hold while spinning. A good length for the string is about 3 feet, but feel free to adjust this length for the size and shape of any player. Although this technically isn’t a bullroarer, your plastic bottles will make odd, eerie noises when swung around in a circle just like the authentic aboriginal instrument. 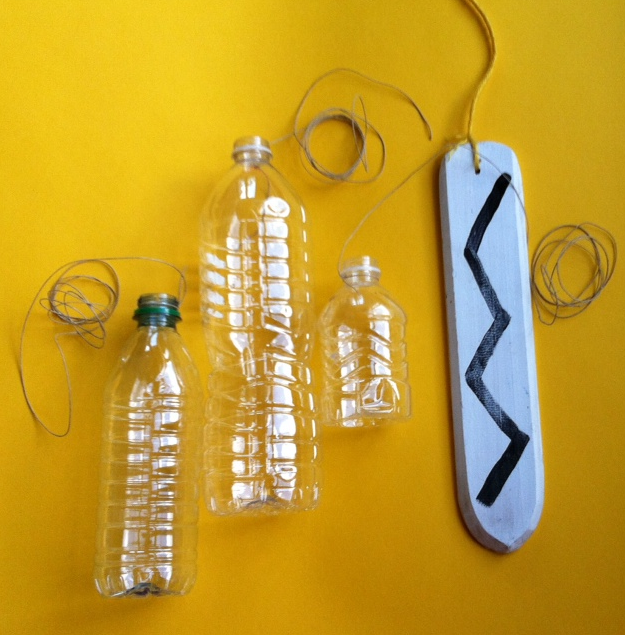 One hint: pick plastic bottles with smaller openings as they seem to make the best sounds when used in this project. Although spinning a plastic water bottle is much safer than spinning a piece of wood, it helps to consider safety when playing this instrument. Anyone playing a bullroarer should be outside in an open area, away from people or things that things that could be hit accidentally. Once you’re positioned safely away from any people or objects, simply hold the one end of the string and swing it around. Swing it either in a circle in front of you, to the side or over your head. As you vary the speed, the sound will shift both in volume and in tone. Play with your one plastic bottle or different bottles to find the type of sound you like the most. If playing with a group, you can position kids or people in different areas with plenty of space between them. For instance, if you’re on a playground, you can position kids within large chalk circles with ample distances between them. Participants can all play together or someone can call out names so each player can add their instrument or stop playing. This is a fun way of creating a sonic landscape, especially if different size and shape water bottles are used. Be safe – and have fun! This entry was posted in Australian Music, Ecology/Nature, Family Fun, First Instruments, Multicultural Music, Simple Instruments and tagged Aboriginal crafts, Aboriginal crafts for kids, Bullroarer for children, Bullroarer Orchestra, Bullroarer. Bullroarer for kids, children’s musical instruments, Daria Marmaluk-Hajioannou, Easiest Instruments For Children, Easy Instruments kids, family fun, Green crafts, green crafts for kids, homeschool music, kids musical crafts, Native American crafts, Native American crafts for kids, Plastic Bullroarer, unusual percussion, world music with daria, young children and music. Bookmark the permalink. 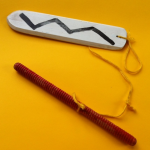 One Response to Outdoor Musical Play – Make Your Own Bullroarer!